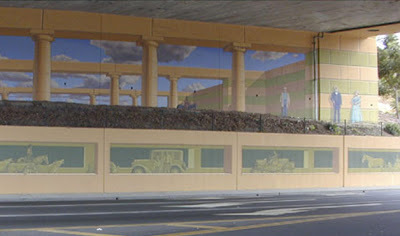 Completed in 2002, this 20,000-square-foot painting—located under Interstate 80 between residential neighborhoods in Pinole, California—required 20 days of lane closings and 1,300 gallons of paint to complete. It depicts scenes from the city's past and present, including historical figures and painted autos, according to Wehrle's website, TroutInHand.com. Photo courtesy of John Wehrle.